Craigdarroch is a Georgian country house built by William Adam in 1729 and incorporating bits of an earlier house dating to at least the 14th century. 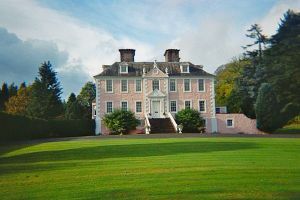 Craigdarroch was the seat of the Fergussons of Dumfriesshire for over 6 centuries. More famously, it was the home of Annie Laurie, the real-life woman behind the love song of the same name. Annie (or Anna) Laurie married Alexander Fergusson in 1709 and lived at Craigdarroch for 33 years. The song was written by William Douglas, who had a brief, ill-fated romance with Laurie that was cut short by her father's objection to the match. Laurie married Fergusson, and it was under her direction that Craigdarroch House took its present shape. Laurie died in 1764, and some versions of her story claim that she is buried at Craigdarroch. In 1726 Annie Laurie (Fergusson) and her husband asked William Adam, father of the famous neo-classical architect Robert Adam, to build a new house. A young Robert Adam made the fireplace in the hall under his father's expert supervision. Annie Laurie's son, James Fergusson, held Craigdarroch during the 1745 Jacobite rising under Bonnie Prince Charlie. When the Prince's army asked Fergusson to provide hospitality, Fergusson and his household fled. When they returned to the house they found it badly damaged, and much of the laird's fine furniture used as fuel for the fire. 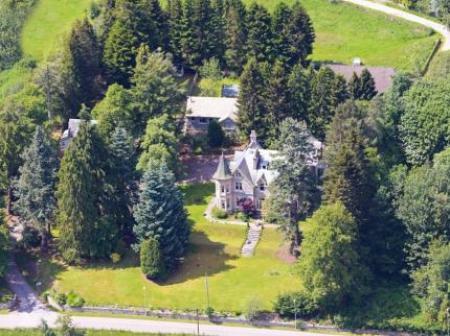 That was not Craigdarroch's final dealing with soldiers, for during WWII the house was used as a base by a unit of the Norwegian army. Craigdarroch is presently open to visitors for set periods in the summer months. This lovely , detached house in Moniaive sleeps six in three bedrooms.